I know I’ve slowed down a bit in terms of updates and information and the truth is that this reflects the activity which has been going on. Plus, I only promised about 1 article a week and it’s only been a week yesterday…so stop whining!!! The purpose of this post is to reassure you that I am still alive and well, while giving you an idea of what in the world (more like what in the England) I am doing. The past week or so has seen me go back to the drawing board. The games I was playing with Albion have dried up a bit. Albion had some players return who had been out in the recent weeks for various reasons. I spoke with the manager and he said that, for loyalties sake, he would be playing them over me and so, unless there was a significant chance that I was going to be getting serious game-time, he would not bother bringing me to games. Usually they would only bring 3 subs for away games in an effort to minimize travel costs and wages (Yes, we would get payed a little per game). So, despite the various reasons for not playing, I appreciated that the manager was straightforward with me and if the proper opportunity presents itself I could play scattered games with them again. I know this isn’t a perfect comparison, but I feel like the situation is similar Rio Ferdinand being snubbed by England in recent months. Among other reasons, including the purpose of “looking to the future”, the England manager Roy Hodgson says that he is not choosing Ferdinand because a player of his experience should always be one of the first in the starting 11. Since he could not assure him of that, he had decided not to add him to the squad. You can read a little more about it here. It’s cause he’s a grumpy old man! Now of course, there is a more than slight difference between getting called up to a national team and playing in a non-league football team. I am not comparing myself to Rio Ferdinand either…I’m far better looking 😉 . Yet, there also some similarities in the situation. I was assured by the manager that it had nothing to do with my ability as a player and that I was a great guy. I was told that it wouldn’t make sense to bring me along to sit on the bench, just like Ferdinand. It was nice of him to reassure me of these things, even if I was already confident of them. 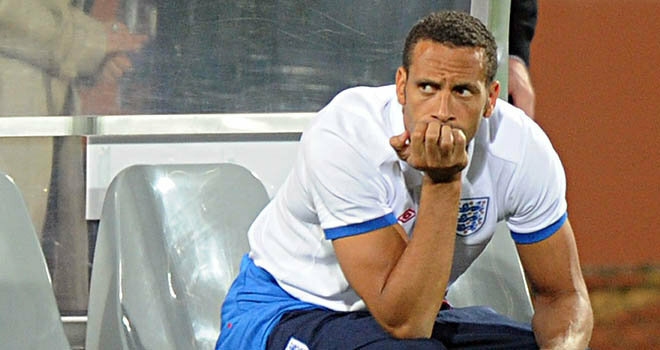 However, just as is the case with Ferdinand and England, you never really know the real issues and reasons behind decisions. Speculation aside, I think the situation with Albion was a blessing in disguise. It has forced me re-align my goals and refresh my focus. I came over to play professional football, and I need to do much more work to get there. Obviously, the loss of playing games consistently is irreplaceable, but there are positives. So, as I say, I have gone back to the drawing board. What exactly does that mean? First of all, I am continuing to train hard on my own. Above all, I make sure that I get touches on the ball. I attempt to spend at least 45-60 minutes a day with the ball at my feet. A normal session will involve quite a bit of juggling, or as they say here “Keepy-uppy”. I don’t just juggle as many times as I can, rather, I make little challenges for myself. For instance, I will do high/low intervals. This means every few juggles (I usually do every 3 or every 5) I hit the ball up in the air (12-15 ft. usually) and then bring it back under control with the designated number of touches before knocking it back up again. So, for a three juggle interval, it would sound something like “tap-tap-kick…tap-tap-kick…and so on”. I also found a great wall to juggle against in the neighborhood because its made out of big stones and is anything but smooth. So, I’m never quite sure how it will bounce back and so it tests my reactions well. I will usually either do 1-touch or 2-touch off the wall. The other important thing I try to do is fitness with the ball. This usually just consists of various sprints with the ball. I sometimes pass off the wall, receive the ball and then sprint 10-15 yards with it. This also helps my first touch. You get very creative overall when you spend enough time kicking a ball around by yourself. I do other fitness on my own as well. I’ll usually run further distances in the morning, usually 3-5 miles. Aside from just simply running at a normal pace, I also like to do intervals; which is basically running hard for a period (about 30-60 seconds), then taking it easy for the next period. Intervals are good because they mimic game fitness more closely. I’m sure some of this might seem obvious to some people and if so, sorry to bore you with the details. The point is, though, that I am putting in hard work and am doing my best to be ready when the opportunity presents itself. The other side of the story, of course, is trying to get that opportunity to present itself. I’ve been back to the drawing board even more so in this sense. I feel like I am investigating a crime, since I have to follow so many leads. Now, don’t get me wrong, I’m extremely appreciative of any help anyone can give me and has given me. I can’t say that enough! However, it’s still a tough process. I’m re-sending emails, calling whoever I can and getting advice from whoever will give it. This has led to some possibilities overall. I spoke with a contact, who knows some people in the Newcastle area and might be able to get me a trial with some teams, if they are looking for players. I have also trained a few times with a good team in the 6th division, but they have a full squad already. It’s also frustrating because most teams below the 5th level are only part time, so they don’t train often, especially when they are playing 2 games a week. There are other contacts who I have been trying to connect with who may give me helpful information and/or provide me with some valuable training/playing opportunities. I just keep knocking on doors. Team training and exposure, are the two biggest things I need right now. I am still motivated, still focused, and still confident, despite any setbacks. This is the hard part, but it is what will make the reward even more satisfying, God willing! As always, I’ll keep you posted on events in the future! Until then, don’t be afraid to dive in head first! Great title:back to the drawing board. Shows both optimism and a willingness to embrace the challenge. Appropriate that you have to keep knocking on doors in your search, as todays gospel (Luke 11) reads: “…ask and you will receive; seek and you will find; knock and the door will be opened to you.FOR EVRYONE WHO ASKS, RECEIVES; AND THE ONE WHO SEEKS, FINDS; AND TO THE ONE WHO KNOCKS, THE DOOR WILL BE OPENED”. What a coincidence! I’ll be sure to keep knocking.